If you wonder why so many of these albums sound big and empty, it is down to the advent of this new thing called the compact disc. It was a status symbol, a benchmark showing just how far above the bench you were, reassuring you that you were far ahead of, and superior to, the masses. Compact discs in the eighties were expensive luxury affairs; they were typically priced at £20-25, and even in the late nineties price tags of £16 or £17 were not uncommon. Now, compact discs are my preferred method of listening to music, far less bothersome to store and search through than ancient vinyl. I do not harbour a nostalgia for warps, jumps and scratches. But it must be said that the success of the format prompted an awful lot of indulgence, allowed a lot of things to pass which perhaps should never have been let through. Moreover, the compact disc was essentially, in its initial stages, a deeply conservative concept. I do not simply mean thrusting Thatcherkids blasting out nothingness from their wall-to-wall car speakers on their way down Threadneedle Street. Like stereo twenty years previously, it caused spectators to gawp and gasp at the astonishing sounds that the phenomenon could produce, but these same spectators elected to use the new system to listen to conservative music. James Last and Ray Conniff in the sixties; Phil Collins and Brothers In Arms a generation later. 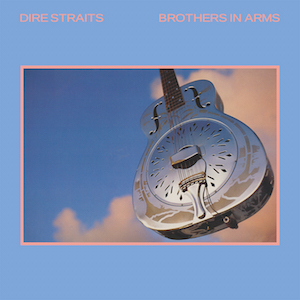 Brothers In Arms was not the first album to be released on CD, nor to be recorded on digital rather than analogue. But it was certainly the first major album to promote itself as primarily being a CD. The LP and cassette editions provided an abridged first side; the CD was eight minutes longer (but even at the abridged length of forty-seven minutes, the record still sounds as though it needs to be edited down by half that length). In other words, if you joined the CD revolution, you were given the whole story. Read the Wikipedia entry on the record, or reviews of it on Amazon, and you will get miles of prose about studio size, microphone and speaker placements, types of keyboards used, the superior quality of SACD. Anything, in fact, except the music that is allegedly being listened to. Nothing really happens on Brothers In Arms, and happens expensively. The darkness, worries and menace of Love Over Gold have been distilled down to a blandly blue motorway, just as David Lean boiled down turn-of-the-century Russia to the deadening snowscape of Doctor Zhivago. If 1985 rock were a Stanley Kubrick filmography, then if No Jacket Required is Full Metal Jacket, Brothers In Arms is Barry Lyndon; a gentler, sleep-inducing bludgeoning. As for the standard view of Dire Straits as earth-honest pub-rockers, it should be noted that Knopfler is the only guitarist here; there are two keyboard players, and aside from some flourishes at the beginning of “Money For Nothing,” it is Omar Hakim, rather than Terry Williams, who plays the drums. Moreover, the few sparks of interest which the record ignites are usually down to outside players; “Your Latest Trick” is musically seductive, largely because of Michael Brecker impersonating Jan Garbarek (and a rather spiky out-of-tempo introductory duet between Randy Brecker’s trumpet and an angry-sounding Knopfler guitar). The bouillabaisse of “Ride Across The River” would be even more aimless without Dave Plews’ Mariachi trumpet touches. And so on. Mixed with this arrogance is a world-weariness which you don’t feel Knopfler has really earned. It is a record of entitlement, smugness and assumed superiority. On “Money” he sneers that he shoulda learned to play the gee-tar, but on “Walk Of Life” he is sneering even at the poor sod busking for pennies in Tottenham Court Road tube station. He has a go at the one-night stand he bumps into on “Your Latest Trick,” even complains at the hapless lover on the other end of the telephone on “So Far Away” as if it were her fault that he was successful and on a world tour. And, of course, “Money For Nothing” is where all of Knopfler’s worst tendencies coalesce. Getting past its grotesquely pretentious introduction, ninety-seven seconds of warming up and Sting humming the MTV jingle, we get some very horrid old school rock. No doubt Knopfler identified himself with the everyman – and vice versa – but all he is doing is sneering at New Pop and their funny ways. Much, much worse is his use of the “f” word – the section that is handily edited out on oldies radio – and even if he is writing in character, he has previous form, both in terms of gay-baiting (1980’s “Les Boys”) and cussed philistinism (1978’s “In The Gallery”). At a time when the facts about HIV and Aids were struggling to become known, this was, to put it VERY mildly, unhelpful. All he – with Sting, who co-wrote the song, as well as providing vocal back-up – is doing is hammering home to the listener how Mark Knopfler and Dire Straits are so much better than everybody and everything else. And mumbling the words can be an especially deadly form of arrogance. And yet this broad expanse of rock desert outsold every other album in eighties Britain (even Thriller), remained on top in the States for nine weeks, has at the time of writing sold some thirty million copies worldwide. Its success implied that “bigness” with all content evacuated was enough. Like virtually every other number one album of 1985, there are practically no laughs (“Money For Nothing” is certainly no laughing matter). We were all expected to be grown-up and serious…but about what? How much direct influence has this album of albums had on anything which has come after it – as opposed to the indirect influence of sizeable streams of large vacuums which the CD era has permitted? I would instead point to a far better and far more pointed example of Northeastern technological folk music in 1985, namely Prefab Sprout’s Steve McQueen. But Brothers In Arms is strictly prefab “class” (pronounced with a flat “a”); music for people who don’t like music, a record for people who don’t buy records. It looks to fill a gap which Dark Side Of The Moon had occupied in the previous decade, but the cover is ominous - Knopfler's 1937 National Style O Resonator guitar floating into the blue air, without visible means of support, as if to say, rock and roll? That's your lot; grow up. Next: the same problem from the opposite perspective. The album sleeve sums up the boring side of the 1980s in one. I much prefer what was 'side 2' to 'side 1' - in fact The Man's Too Strong is one of my favourite tracks by anyone - a brooding menace to it with some great playing, and the synth isn't overcooked either. Sounds great played loud. On the other side of the coin, I could never abide Walk Of Life ('circus music' Beavis & Butthead called it, I can get with that), it reminds me of early 86 which was crap for me anyway, but it's a bloody annoying track and was overplayed considerably at the time. Your Latest Trick and Why Worry are pleasant, but dreary. Money For Nothing is much better in the economical single edit. Despite all this, I like it. And I'm not even in that genre. I was in love with 'Blue Monday' and would go on to buy 'Meat is Murder'... and yet. My brother bought this at 11 in an amazing fit of independence, surprising me greatly (he went on to be a big Nirvana fan) - and I adopted it. Neither of us were exactly the target audience and didn't even own a CD player - it was on scratched vinyl. I was too young at 14 to care about bland production and the cultural baggage, but I saw something thoughtful and imaginative in this album that clearly bugger all other people have. It helps that I was going through the week-by-week shattering finale of 'Halo Jones' at the time and some of the songs really stuck with my imaginary film of the story. I think it's a lot easier to like records when you're 14 and don't have critical reading and coolness to uphold as you do when you're 18. At 18, I pretended not to like it and spent all my energy defending 'Technique' from indie purists. All I can say is, Sir, you are a much braver man than I for sitting through this album. If you're ever in Manchester, I'll buy you a pint in lieu of a medal. In hindsight, I was glad that during the many long car journeys I went through as a young child in the 1980s, my dad opted for Kinks/Beach Boys/Beatles compilation tapes rather than this sort of thing. I will admit to having a soft spot for Der Straits "Tunnel of Love", mind. The best thing about "Walk of Life" is that it meant we'd never hear "Twisting by the pool" again! Always sounded like a bad Christian rock group attempting to write a secular rock/pop number just to show they're not all 'serious'..
Wow! Am I the only one who likes this album? For some reason it has a certain charm for me. I always thought the songs sounded good on the radio. Oh well! I guess there's one in every crowd!! i thought it was awesome. as a young lad against a backdrop of thatcher, miners strike and nuclear war. it was a great 45 min distraction. many bought it twice, lp in 84, cd in 86. it made me pick up a guitar, so i am eternally grateful to it. If anything you are too kind about this. A truly despicable record: smug, hollow and musically dead. I get more from Music On Hold than this depressing claptrap. To be honest I've always been baffled by the success of Knopfler. His singing is uniformly ugly, his music derivative and his guitar skills overrated.